Duchess Kate: William and Kate's Helicopter Ride + Latest Shopping Trip! William and Kate's Helicopter Ride + Latest Shopping Trip! William, Kate and Lupo were photographed taking a helicopter ride with their friend from their home in Anglesey, North Wales to an aerodrome on the outskirts of London following a 200 mile flight. 'We had no idea it was the royal couple at the time. We had a look at the photos on our laptops a few days later and realised that it was in fact Prince William and Kate. It's amazing to think that we saw the royal couple without any crowds around them. They were like any other couple out with their dog - albeit having just been flown in by helicopter. Lupo was very behaved. Kate let him down on the grass and he stayed close, although you could see he was excited'. The orange McDonnell Douglas helicopter carrying William and Kate belongs to a friend of the couple's, Timothy Oliphant-Hope who is managing director of Shoreham based Eastern Atlantic Helicopters. Mr Oliphant-Hope was behind the controls and said he occasionally gives the couple a lift "when he is routing past North Wales, if it is convenient for all parties". Kate was casually dressed in her grey wool Zara tweed jacket. The military wool garment features gold buttons and is thought to be from the brands 2011 collection. The Duchess was photographed wearing in last month during a shopping trip to Design Centre Chelsea Harbour. Kate wore a loose fitting black top underneath. The very talented Ashley Marie (@livelovelaughvr) from WKW FB identified Kate's jeans as the Topshop 'Leigh' Maternity Jeans. 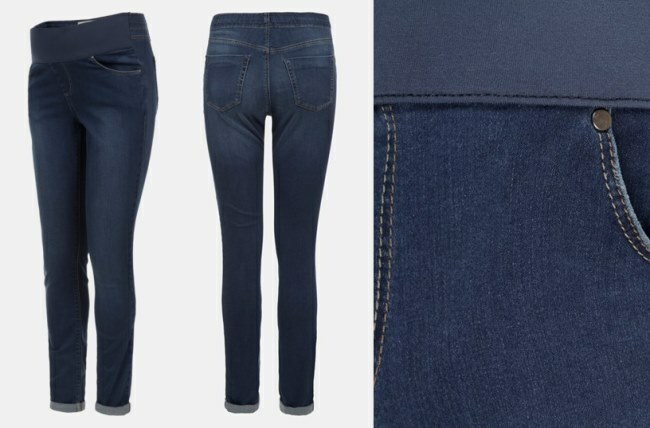 The medium-rinse skinnies are crafted with a tonal band to accommodate a growing bump for supportive comfort. They're available for €61 at Nordstrom. 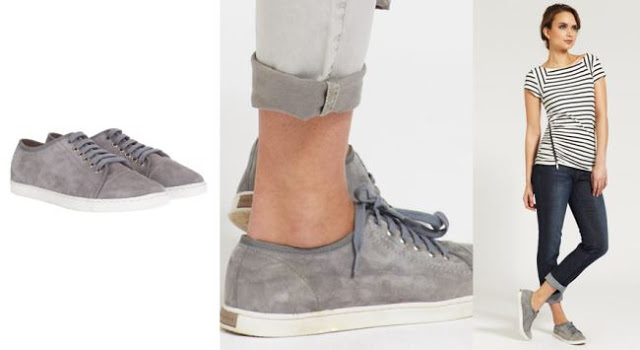 Kate opted for comfortable footwear - her Mint Velvet Taupe Suede Plimsolls. 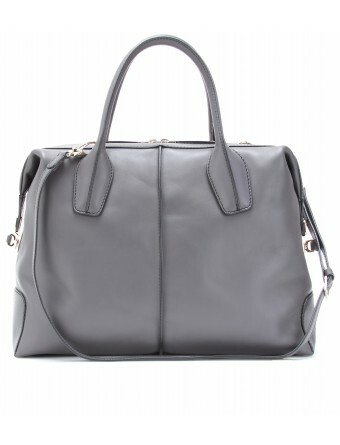 The Duchess carried her Tod's D-Styling Bag. Upon their arrival in Denham, William drove off in his range rover while Kate and Lupo left in a separate vehicle. It was not revealed exactly when the photos although it is thought to be the last week in May. 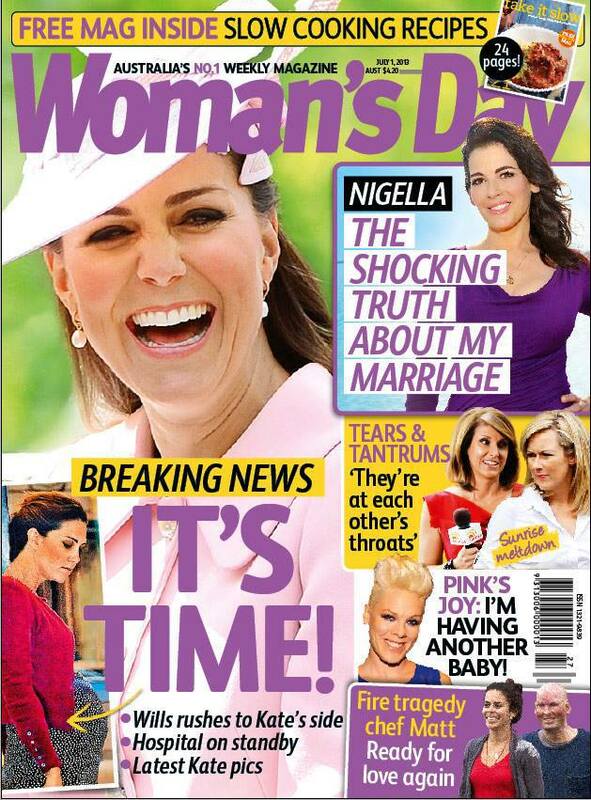 A new photo of the Duchess out and about shopping appears on the cover of Australian magazine Woman's Day. A look inside the magazine. Susan from WKW correctly noted Kate's dress appears to be maternity brand Séraphine's Wrap Dress With Tie in the navy spot colourway. 'This gorgeous mock wrap maternity dress is an essential for your maternity wardrobe. In a pretty navy polka dot print with a chic side bow detail, the dress is perfect for any occasion. The above the bump side tie highlights your empire line and flatters your bust and growing bump. The short sleeve dress also comes in blue'. It's a very pretty frock and looks like a comfortable piece. Kate teamed it with a pink cardigan. From what we can see the Duchess appears to be browsing through fabrics and wore her hair in a pretty updo. Another post! Charlotte, thank you for updating so fast! I don't know how you manage to do so many things during the day! Well, even though I love to see new pictures of Catherine, I can't help feeling sorry for the lack of privacy she has. If I was the person who "accidentally" took the pictures, I would keep them to myself as a particular treasure. But, who knows, maybe they needed the money for something very important. The headline in Woman's Day is a tease. Not that I expect to see "Breaking News" in a magazine in this day and age, but it did get my attention. Lol. I read some of the comments in the DM and a few people were surprised that they flew in a single engine helicopter due to safety concerns (and I know nothing about them so forgive me if I am way off here). IF true, I think that's a valid point. Wow, Charlotte - a two post day! :o) Well done, you! You're amazing! I hope, as others have mentioned, that the press backs off and gives the Duke & Duchess some space after the baby is born. There's nothing one can do about people tweeting private photos, but surely the paparazzi can give William & Kate's family some peace. Hello, are you having difficulties posting comments? Do let me know if you are. Thank you Charlotte for this great post as usual. Just as a summary, it's pretty much just talking about everything that we already knew or could probably guess. I agree with the above commenter, the title is very misleading. Anyway, the article just talks about how William is on stand-by and ready to get to Kate's side as quickly as possible while he continues his work in Wales. It also talks about any pre-birth jitters that Kate might be having, which as a mother myself I have no doubt is true, especially with William away. It mentions that the palace will announce when Kate goes into labor, but my understanding was that nothing will be announced until the birth itself? A big thank you to Charlotte for the post! I love your blog!!! Womans Day is well known to make up most things they publish. I would even go so far to say that new photo of Kate is photoshopped. How come the photo hasn't been seen anywhere else (well not that I have seen anyway) and I doubt from other photos I have seen that she looks that big. And I agree, we are not going to hear about the birth in a magazine. I totally agree. My first thought with a title like that one on the cover was that the photo was photoshopped too. Obviously, William has not needed to rush to her side yet. PS I also sort of wonder about the people not knowing whom they were photographing. Who just takes pictures of random people and a dog getting on a helicoptor? Hahaha! :-D Good point, Elizabeth from CO...I don't know anyone who takes photos of strangers getting into helicopters! Her "bump" is larger in the cover photo than in the helicopter pictures. Lol. A WEE bit of drama??? (pardon the pun). Oh Ms. Charlotte you always suprise us with great new posts. They both look very happy. Thank you again for bring us this new/old sighting of the beautiufl & glowing Duchess & her handband hubby. @royalfan- I would not worry about them taking a single engine chopper. I am very sure that William would not put his very pregnant Duchess on something that was not safe. And it is safer flying in a chopper then driving in a car even if it only a single egine. I have friends that fly and they are very safe. @Ana B- I agree with you. We all like to see pictures but this was something they could have kept to themselves. And it was not even current. These were supposely taken in May. So like you said maybe they needed the money. I hope it was worth it for them since they invald the privacy of the royal couple. Bluefire, I hope you enjoy your time in London! It is a FABULOUS place to visit! I am trying to go back towards the end of the summer. :) Maybe you'll catch a glimpse of Kate out and about. Do keep us posted! Happy and safe travels! The pictures you submitted to Charlotte were awesome! What an amazing experience! I'm so glad that you had a wonderful trip and have returned home safely! Thanks Shantel! It was an amazing trip and I feel very blessed to have had the opportunity! Wishing I could be there when Baby Cambridge is born, but I guess we'll enjoy all the excitement from this side of the pond! Hope you are having a good week! Kate looks absolutely adorable in the picture! The bump is beautiful! Charlotte, that looks like the same pink sweater Kate wore over the blue Asos dress while out shopping at Bernard Thorp. Thoughts? I know you will have all the details. I always love when Kate wears her hair up...so pretty! Thanks for another quick post and latest info! I think the picture on the cover of Woman's Day is the first picture were Kate really looks like she's about 8 months pregnant. With all the coats she wore the past months it was always hard to tell how big her baby bump really was. Thanks for a new post Charlotte. The helicopter story seems to be four or five weeks ago, but I do like it. Catherine's hair looks lovely and I always think she is at her best when casually dressed--she's really a country girl at heart. Must say the photo on the front of the magazine looks odd---the top is surely Catherine and we have seen the pink cardigan before, but the bottom half seems as though it's been transplanted from elsewhere--just looks odd. Maybe it is just the angle! Several of the newspapers now seem to be suggesting the birth is more imminent than has been suggested---but only time will tell. Jean, my thoughts exactly. Kate's bump looks really weird on the cover of that magazine. It has a strange, pointy shape. The picture doesn't seem real to me. Thank you for this second post, Charlotte! I also wonder what was this couple doing there the same time as Will and Kate? I have just read the article on dailymail about Carole watching tennis today. Catherine and her mother are very much alike, these gestures, posture, smile. I hope one day I will be able to watch all Wimbledon matches live ! Something tells me that cover photo is doctored. She just hasn't been carrying that way. Just my opinion. Thanks Charlotte for the extra pictures! I am on pins and needles waiting for Baby Cambridge! I'm glad that I'm not the only one to think there must have been some photo shopping going on with some of those Australian magazine's images of Kate. I simply do not believe that her bum is that big. She is so slim and has stayed that way throughout her pregnancy. I am glad I am not the only one who thinks the magazine photos are photoshopped, her bump is way bigger and her bottom (to be proper) is way disproportionate in the small middle photo. I believe in general the photo of her shopping is real, just her bump made to appear larger.. since Kate has miraculously had a quite small and at times hard to see baby bump. I'm thinking the 2nd photo doesn't look so real. Kate doesn't have a big behind, the bump could simply look bigger because her dress is tighter/hugging her body, but her behind looks way too big (although maybe it is that the photo was taken as she is taking a step fwd). Kate looks lovely, better than at many official engagements - I'm a big fan of her "single" style (pre-wedding). I always find her everyday outfits to be much younger. I found an interesting article, I really agree with the author. Except when she mentions *ankle boots* I hate those :p Hope you guys can see it. I have to say, agian in reference to that article and to the recent "list" saying Kate is the 2nd most stylish royal, after Princess Mary of Denmark. I wasn't a bit surprised. Princess Mary has always been my favorite. I love her outfits and I think she has a lovely figure - healthy, fit and toned. I also like Princess, oops, Queen Maxima. QMaxima is always so happy and friendly. She also likes to take risks with her outfits and LOVES color. Princess Letizia has very nice outfits, but I dislike all the platform shoes (although I understand that her husband is SO TALL and she looks pretty petite next to him) and the fact that it is very obvious that she suffers from an eating disorder, kind of made me sad that she was included in the top 10. I happen to love Mary and Maxima and I enjoy "following" both of them. Mary is always polished and elegant and Maxima has an amazing and unique style of her own. And her warmth and energy is admirable! Mary and Kate were one percentage point apart on that list which makes them pretty even, IMHO. Not bad for a young woman who has been in the royal family for just over two years...and one who goes out of her way NOT to be seen as a clothes horse. Just imagine if Kate was as far along as a royal (time-wise) as Mary, or if she devoted as much money to her wardrobe. And I'm not being critical of Mary at all. It's just the reality of the situation. The jacket and the shoes reminded me of the last time she wore her Aquascutum scarf. I have to warn you -- I purchased this online from John Lewis (the only vendor that I could find that carries it). Well, I am new to this whole scarf fashion and it looked longer in the picture, plus it said it was a men's so I thought, ok, it will be larger -- wrong! I got it in the mail today (shipped to me by the export dept at John Lewis - they are fabulous!) and it is 58.5 inches by 12 inches. Unfortunately, nowhere was the length mentioned on the the website, otherwise I would have known it would be a bit short. So bummed! I have a strange feeling today. Maybe it is time for Baby Cambridge to arrive ? But it is not the British taxpayer paying for this. The money comes from the profits on Crown Lands. The Queen gets 15% of this and the Exchequer gets the remaining 85%. Out of her share HM pays all the expenses of the Head of State---which last year was heavier than usual beoause of the Jubilee and the Olympics---all the extra entertaining of foreign Heads of State.. It also covers the upkeep of Royal Palaces--so HM paid for Kensington Palace. I know the Daily Mail and Republicans says the Crown Lands never belonged to the Monarch--but they did--indeed Queen MaryII and her husband William III(William of orange) bought Kensington Palace for £20,000 and Queen Anne added to it. George III made an arrangement that the Exchequer would have the proceeds in return for costs of the Monarchy. The Queen receives no income from the state and Catherine receives nothing---except that Charles pays for her clothes from his private income. It is certain that a President would be no less expensive.In fact the French President costs more. Finally the apartment for William and Catherine has 20 room not 57--so if the cost of repairs and roof covers 57 rooms---it must be the majority of the palace. Most of the money was for removal of asbestos. That would certainly have to be done, even if no one was to live there and it became purely a museum. @ Jean from Lancs- It does come out of taxpayer monies. The apartment reno's do not come from profits. That goes toward Queens expense. Taxpayer monies paid for the apartment renovations along with their trip last summer. They have already disclosed that it did indeed come out of taxpayer monies. The Crown lands profits are not enough to cover the cost of just the reno alone. It has to be disbursed to other areas of the royal household. Government has already spoken on this and that is why it has become an issue, because they disclosed that unfortunately we paid for much of this; while they are cutting spending in other areas. And the Queen is getting a raise. Jean I have to commend you on putting the facts so eloquently and indeed correctly. I often have this debate with my husband over the 'cost' of the monarchy...Irrespective of who lives there KP would have needed renovation and the asbestos has been a factor in the increased price. I don't think W&K own their apartments either - I would imagine they're given a life tenancy or such. The monarchy costs 53p per person in the UK and I think that's very good value for money - seeing HM win the Gold Cup last week was (imho) priceless! We're off to see the coronation exhibition in a couple of months and the diamonds last year were superb! I think it's great that we've got them. The photos in the DM are very misleading. Surprise, surprise. The scaffolding with the image of the palace on it, and all the work being done to the roof and chimneys, is NOT William and Kate's apartment. Their apartment is to the left of that and, although it appears that work is being done to the façade there as well, it's unfair to attribute ALL of the cost to W&K's apartment or to suggest that they are the sole reason for everything that is being done. Prior to March 2012, the State Apartments and the public grounds underwent 12 million pounds worth of renovations before they were re-opened to the public. The current project seems to be a continuation of that. Yes, renovations were made to W&K's apartment before they move in, but the great majority of the work being done on KP has nothing to do with this couple. But it does make for a good deal of pot stirring at their expense. I'm waiting for an article that blames all of the "doggie treasures" left in Kensington Palace Gardens on Lupo. LOL. Surprised no one thought of it yet. Hi Charlotte :) hope you are having a lovely summer! I don't quite understand the level of venom directed at the couple who photographed Will and Kate getting off the private helicopter. So what? There's a small public airfield near where I live and people who are airplane buffs go out there all the time to watch the planes land and take off. It's not some huge paparazzi conspiracy. And as for them flying in a private helo, I don't doubt that they travel by private means far more often than we think. It's not all private trains and motorcades and official RAF helos, you know. They are a wealthy young couple with access to alternate modes of transportation, like private helicopters. Will and Kate are a public couple and they were before their marriage. They certainly understand and have accepted (since Kate did go ahead and marry William and he hasn't abdicated his position) that they are going to be photographed when out in public, even in as casual a setting as this was. Keep in mind that many of the folks taking these casual snaps are subjects of the queen and will day, likely, be subjects of William and Kate themselves. Not likely they're going to march over and tell them off, is it? Very well said, Jean from Lancs! Hi, I didn't see a comment like that? Unfortunately some comments are moved into spam and deleted due to a glitch. Going to have to weigh in and say those cover photos look definitely Photoshopped to me. If you look at Kate's pregnancy even at her last engagement, there is no way there could be that much difference between then and when these pics were taken, even if you look at her shopping near her home last Saturday, she's nowhere near this big! She appears to be standing near something whose pattern closely matches her dress in the one that makes her rear end look huge but even if she wasn't, she's nowhere near that big. Definite - and obvious - Photoshop job. i hope kate doesnt lose too much baby weight she looks healthy for the first time since their engagement! her face is fuller and makes her look 10 years younger..does anyone remember how scary thin she looked the day she looked at her wedding dress display at buckingham palace with the queen? it was scary..yeah sure the baby belly can go away but she should maintain some of her weight gain! The reason the photos look 'shopped is because (a) she's slumping in the first one, thereby making her entire body look "off", and (b) there is a vase or something on the shelf behind her that is adding to her rear end on the second one. I agree with you bluehare, when u look again the points u made are right. I wish she'd wear her up more on her royal duties looks so much better. I ve always thought Kate's ( & pippas ) casual style is so much better than their dressed up looks. Polly. Wiltshire.